Who says potatoes have to be boring? These healthy recipes will rekindle your love of the spud. If there’s one ingredient everyone can love, surely it’s the potato. Veggie haters like to pretend it’s not a veggie and chow it down right alongside a hunk of meat. And vegetarians celebrate this tuber in style with decadent dishes like crispy potatoes topped with vegan avocado aioli. The potato gets dressed up for fancy French dinners and dressed down for good ol’ fashioned French fries, and the only downside is good potato dishes can be absolute calorie bombs. These 7 healthy potato recipes pare down the calorie count of the classics without cutting out any flavor. 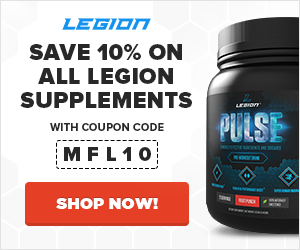 You’ll get plenty of nutrients too – so forget that myth about potatoes being “empty calories.” One potato contains a third of daily recommended value of vitamin B6, meet a quarter of your daily potassium’s needs, and has a healthy amount of copper, manganese, antioxidants, and vitamin C too. Too many traditional dinners have been banished in the name of “clean eating.” It’s possible to rethink your favorite recipes so they’re lighter but don’t lose the flavor of the real thing. This popular French potato dish uses a lot of butter, milk, and cream to taste rich and delicious. 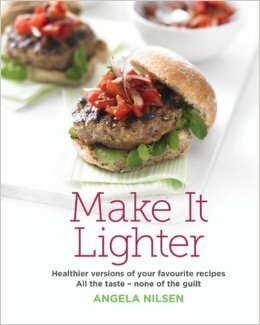 But the version from Make it Lighter by Angela Nilsen cuts the total calories, fat, and salt in half. The result is an indulgent-tasting side dish to serve alongside your favorite protein for a healthy meat-and-potatoes meal. 1. Preheat the oven to 325°F. Prepare a casserole dish by brushing oil over the bottom and sides. 2. Put the milk, garlic, thyme, bay leaf, and shallot into a saucepan. Bring just to a boil, and then remove from heat. Add nutmeg and a little pepper, and set aside to infuse while you prepare the potatoes. 3. Peel the potatoes and then slice very thinly. Pat them dry. Layer half of the slices in the dish, overlapping slightly, and then season with pepper and a little salt. 4. Strain the infused milk into a jug. Put the crème fraîche into a bowl, and then gradually pour in the milk, whisking until smooth. Add the stock and thyme leaves. Return the liquid to the jug, and then pour half of it over the potatoes in the dish. 5. Layer the rest of the potatoes in the dish. Add the remaining liquid, the cheese, and a grind of black pepper. 6. Place the casserole dish on a baking sheet, and bake for 75 to 90 minutes. Once finished, the potatoes will be golden and tender. Test by inserting a sharp knife through the middle. 7. Let stand for five minutes before serving. Sprinkle with small sprigs of thyme, and enjoy. 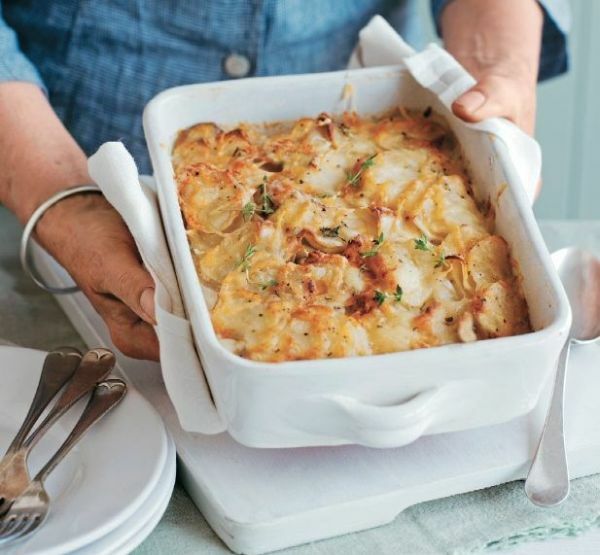 Cheesy potatoes are the linchpin of many amazing breakfasts, and this one is no exception. 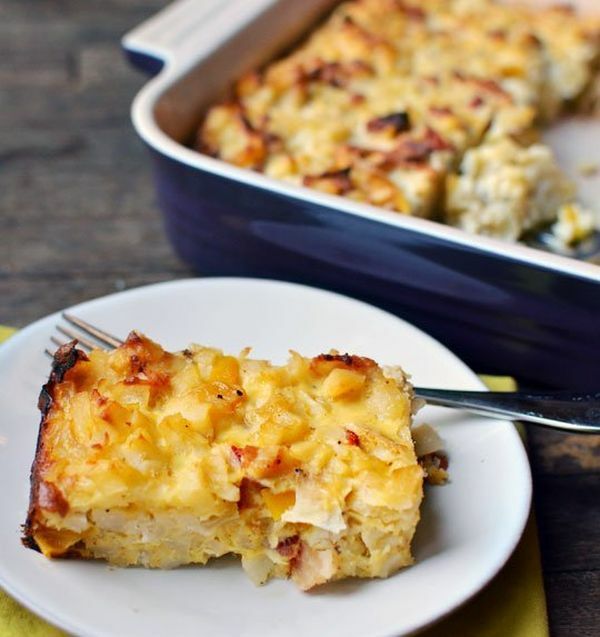 This potato casserole has everything to satisfy comfort food cravings: cheese, eggs, mushrooms, and bacon. And yet as much as it delivers on taste, it wins in terms of nutritional balance. There’s even a whole bunch of kale for good measure, so you’ll start the day off with a lot of vitamins and a good amount of protein. 1. Preheat the oven to 375°F. Lightly grease a square baking dish, and set aside. 2. In a large skillet, heat the oil to sauté onion, bell pepper, mushrooms, garlic, bacon, and Fines Herbes. Stir often. Once onions are translucent, set aside. 3. In a large bowl, whisk together the eggs with both cheeses. Stir in shredded potatoes. Add the sautéed bacon and vegetables. 4. Spoon the mixture into the square dish, and bake for 45 minutes. When done, the casserole will be firm. 5. Serve the breakfast casserole on a bed of baby kale. Picture & recipe courtesy of Skinny Ms. There are a lot of ways to lighten mashed potatoes: replace the butter with Greek yogurt, switch out the full-fat sour cream for low-fat, and sneak in other veggies like cauliflower. But this has to be one of the most unique – not to mention healthiest – ways to serve classic mashed potatoes. Until the fresh spinach leaves are peeled off, everyone’s favorite side dish is unrecognizable. 1. Boil a pot of salted water. To the side, set a bowl of ice water. Over high heat, blanch the spinach for about 30 seconds. Quickly transfer it to the water to stop the cooking. 2. Spread out the spinach on a plate, and carefully pat dry. Divide the spinach leaves by four. Set aside. 3. In the same pot where you cooked the spinach, boil the potatoes for about 20 minutes, or until tender. 4. In a large bowl, mash the potatoes. Then mix in the oil, buttermilk, salt, and pepper. 5. Spread out one-fourth of the spinach leaves on a plate, and spoon a quarter of the mashed potatoes into the middle. 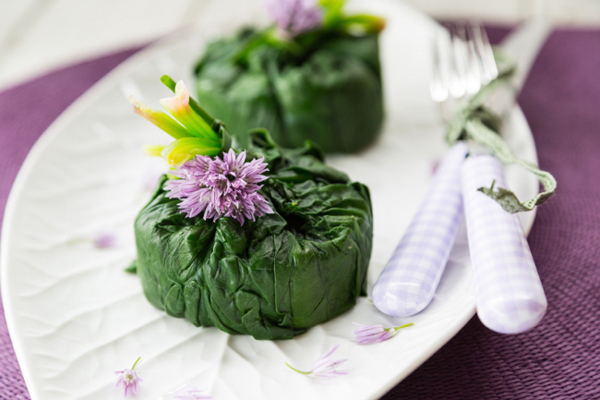 Wrap the spinach leaves around the mashed potatoes, and gently press into a disc. 6. Repeat the previous step until all four servings are prepared. Featuring a mix of earthy flavors, this recipe is from The Nourished Kitchen: Farm-to-Table Recipes for the Traditional Foods Lifestyle. 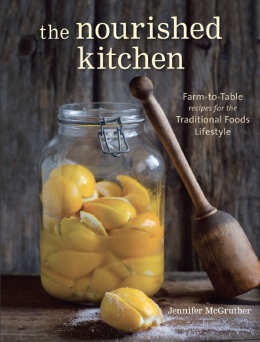 This book includes all kinds of down-to-earth recipes that include fermented vegetables, raw dairy, kombucha, and bone broths – like the kind you can use in this unique potato soup. 1. Melt the butter in a heavy stockpot over medium heat. Toss in the chopped bacon and allow it to render its fat and become crisp, about 6 minutes. Stir in the onion and fry it until it softens and releases its fragrance, about 3 minutes. Stir in the jalapeño and continue frying for 1 to 2 minutes, until the chile pepper is fragrant. 2. Toss the potatoes into the pot and pour in the broth. Cover the pot and allow the mixture to simmer for 30 minutes, or until the potatoes fall apart when pressed with the tines of a fork. Stir in the spinach, cover the pot once more, and turn off the heat. Let stand until the spinach wilts in the heat of the soup, about 8 minutes. 3. 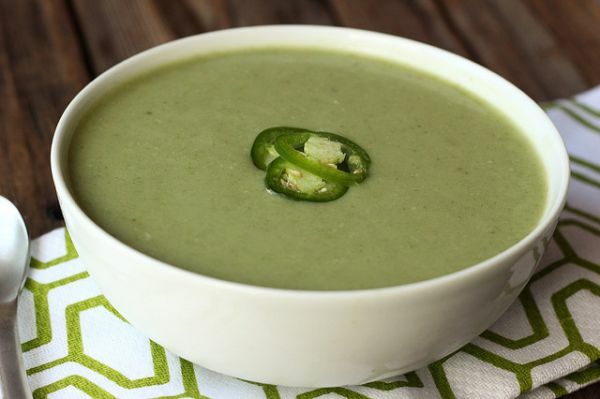 Puree the soup with a blender until perfectly smooth, with no lumps remaining. Season with salt and serve the soup, topping each bowl with a spoonful of sour cream. 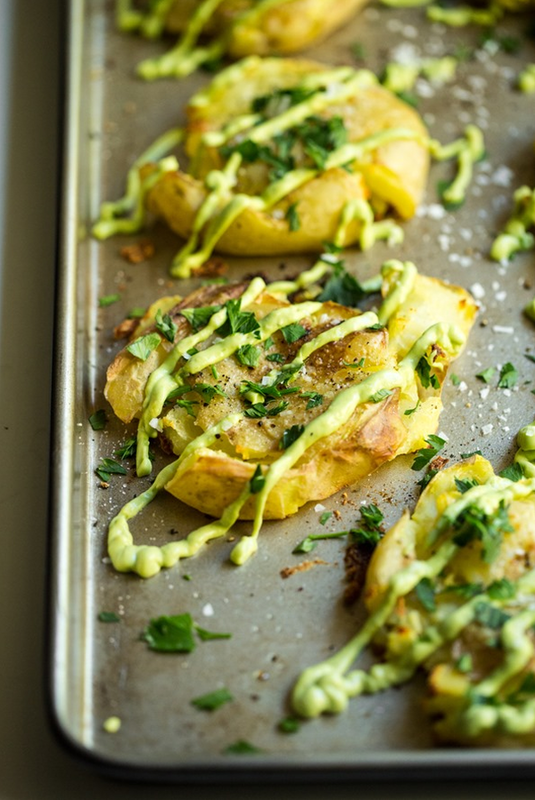 These delectable looking smashed potatoes are vegan, but if you serve them for a special occasion, no one will have to know. First, the potatoes are boiled until tender. Then, the skins get nice and crispy after being rubbed down with olive oil and roasted in the oven, and the final result is an amazing twice-baked potato. The only possible improvement? If you’re not vegan, sprinkle some Parmesan cheese on top. 1. Add potatoes into a large pot and cover with water. Place over high heat. Once the water boils, reduce heat slightly, and simmer uncovered for 20–25 minutes, until tender. 2. Meanwhile, prepare the avocado aioli. Add garlic into food processor, and process until minced. Place the avocado, lemon juice, mayo, and seasonings into the bowl, and process until smooth. Scrape down the bowl and add salt and pepper as needed. 3. When potatoes are fork tender, drain and set aside to cool for 10 minutes. 4. Preheat the oven to 450°F. Lightly grease a large baking sheet. 5. Place the potatoes on the baking sheet, and with the base of a heavy mug or measuring cup, smash the potatoes until mostly flattened. Some potatoes might break apart a little, and that’s ok.
6. Drizzle each potato with about a teaspoon of oil, and sprinkle a generous amount of salt and pepper over top. Add a pinch of garlic powder. 7. Roast the potatoes in the oven for 25–30 minutes until crispy, golden, and browned on the bottom. Keep an eye on them towards the end as the cook time varies depending on the size of the potatoes. 8. Remove from the oven, and sprinkle the potatoes with fresh parsley, more sea salt, and fresh ground pepper. Drizzle with avocado aioli, and devour immediately. 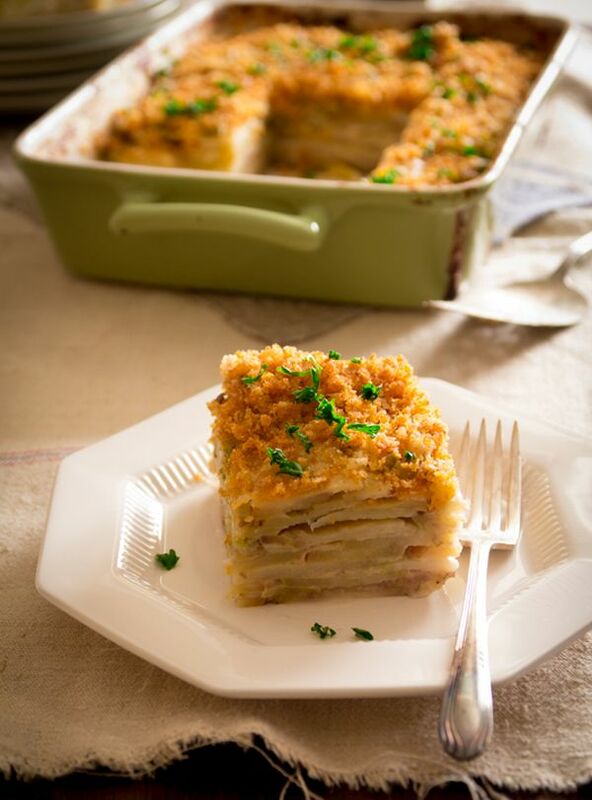 Part of the reason potatoes get a bad rap dishes like classic potato gratin are mostly potatoes, butter, and cheese. This gratin has all the requisites but cuts back on the calories, making it viable for daily enjoyment. 1. Preheat the oven to 350°F. Lightly grease a 9” x 13” rectangular baking dish. 2. In a large saucepan over medium-high, heat 1 1/2 cup milk with the garlic until steaming. 3. Meanwhile, whisk together the flour, mustard, salt, pepper, nutmeg, and the remaining ¾ cup milk in a medium bowl. 4. Once the garlicky milk is steaming, whisk in the flour mixture. Continue cooking, stirring often, until the mixture bubbles and thickens, about 7 minutes. Remove from the heat, and remove garlic cloves with a slotted spoon. Stir in a cup (4 oz.) of cheddar and Parmesan. Whisk until smooth. 5. Spread 3 tablespoons of the cheese sauce into the bottom of the rectangular baking dish. Layer in one third of the potatoes, parsnips, and leeks. Pour about one-third of cheese sauce over the vegetables. Repeat with two more layers of vegetables and cheese sauce. 6. Cover with a layer of parchment and then foil, and bake until the vegetables are tender. Start to check after 1 hour 30 minutes. 7. Tear bread into pieces, and use a food processor to create fine crumbs. Add oil, paprika, and garlic powder. Process until evenly moist and orange in color. 8. Remove foil from the gratin. Sprinkle the remaining 1/2 cup (2 oz.) cheddar over the top. Spread the bread crumb mixture over the top, and return the baking dish to the oven for 20 more minutes, until golden brown. 9. Let cool 15 minutes before serving. Top with fresh parsley. This baked potato is anything but boring. Then again, nothing with Sriracha could taste boring! This recipe uses flavors from all over. Thai chili sauce is paired with Mediterranean ingredients like Greek yogurt, cucumber, and chickpeas. Then the ingredients are rounded out with cumin as well as dill. It might sound like a lot, but it all comes together to elevate this simple potato. This is a carb-heavy dish for sure, but the garbanzo beans and yogurt add a significant helping of protein too. 2. Toss the chickpeas with oil, cumin, Sriracha, and salt. Spread them out onto a cookie sheet, and bake 30–40 minutes, or until they start to look just a little bit browned. 3. Meanwhile, use a fork to whisk together the yogurt, dill, and garlic powder in a small bowl. Season with salt and pepper. 4. Slice your baked potatoes almost all the way in half, leaving the bottom intact. 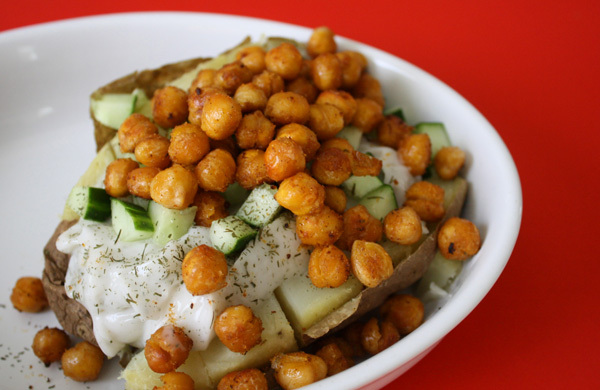 Divide the yogurt mixture between the potatoes, and then top each one with a quarter of the chickpeas and a handful of chopped cucumber. Serve immediately. What did you think of these simple potato recipes? Have anything else to share? Let me know in the comments below!